For those of you that are in the area or may be visiting in the future feel free to come check out our new location! In the meantime we thought we would compile a list of our favorite places to ride our electric bikes around St. Petersburg and Tampa. A strip of sidewalk wraps around part of the Hillsborough River. 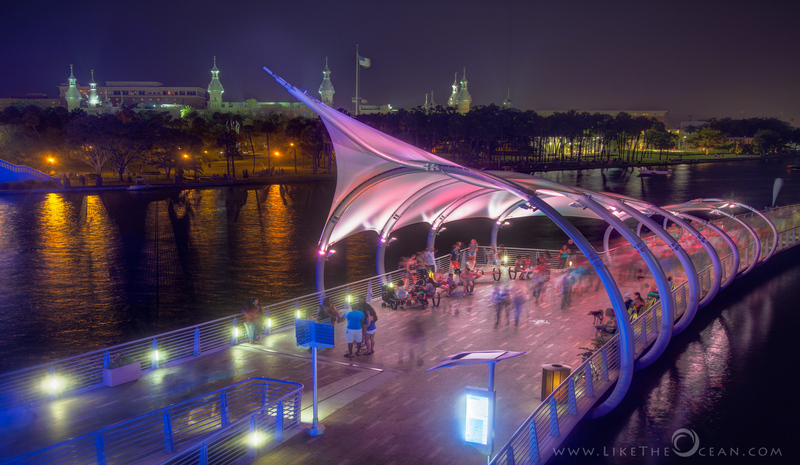 Absolutely gorgeous and lit up at night, this slice of paradise gives you the chance for a calm and cool summer ride, along the water. During the day, the path takes you next to the heart of downtown, and makes for great pit stops along the way, including Tampa Museum of Art, the Amalie Arena, or the Patel Conservatory. Or, if you get hungry, there are a plethora of shops, restaurants, and bars around the corner as well. The Riverwalk is perfect for all of our e-bikes. Similarly, check out Bayshore Blvd. An asphalt trail that winds its way around Pinellas County for an amazing 50 miles giving a great first hand view of multiple neighborhoods and city areas around the peninsula. Reaching from St. Petersburg up through Tarpon Springs, the trail even goes into Pasco county. Along the way you pass by Clearwater, which has one of the top rated beaches here. The Fred Marquis Trail is a great way to explore the area, and just see what the St. Petersburg area has to offer. The perfect trail for commuting into work or going on a long weekend adventure. With a wide range of trails at different expertise levels, the Balm-Boyette Scrub Preserve is a nature/mountain bikers dream, as it was ours. These trails place you in the middle of Tampa Bay’s serene, nature filled areas. Compared to a lot of the other biking Tampa has on paved roads through city areas, this gives a whole different feel and level of biking. With some of the most challenging trails in the area, it gives the opportunity to test your skills, and your Veego’s ability. The heart of St. Petersburg is an amazing place for you and your Joey electric bike to ride through the streets on your morning commute, or to the shops and restraunts for a night on the town. Enjoy a calm evening with the wind blowing through your hair as you ride, stopping for ice cream or dinner along the way. We promise, you won't regret it. Let us know if you have any other favorite places around the area to bike around. We would love to get more suggestions, and tips on where to go. Comment below! Check out Longboat Key for a scenic ride?They bike on the sidewalks and everyone uses bells when approaching on you.When I visit next winter I’ll send an invite to play some tennis or just sit around the pool or take in one of the most beautiful beaches in the world.Congratulations on RideScoozy doing so well.